Triumphant Pest Control - Gwinnett, Hall and Jackson County: Your local termite control, removal & treatment experts! For termite control & exterminators in Gainesville, Gwinnett or Athens GA, call Triumphant Pest Control! Triumphant Pest Control offers a variety of termite and pest control services for residential and commercial establishments. Termites can be a real problem for those who live anywhere in the south. Current research shows that there can be as many as 60 – 70 colonies of termites per acre of land. Termites cause millions of dollars worth of damage each year. Concerning termites, it is not a matter of if your home will be attacked- it is a matter of when. Every Georgia homeowner who lives in the metro Atlanta area should have their home protected from termites. 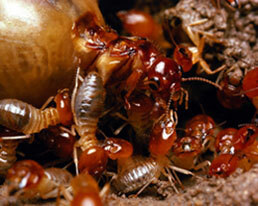 For termite control we offer two different solutions. Our goal in treating for termites is to offer the homeowner the best possible solution that meets their need. Liquid Treatment: We use non repellent termiticides such as Termidor and Premise. The older types of termiticides repelled termites but didn't effectively eliminate termites. Non repellent termiticides are not detected by the workers of the colony so they walk through them and then pick up some of the molecules of the product. When the workers feed the queen and other cast members they pass some of the product to the others of the colony. Since termites are very social and since the product is not detected by the termites then they easily pass it on to the other cast members which provides highly effective control. Georgia termites pose a threat to any homeowner. If you are interested in termite treatment from ASAP Pest Control, give us a call today.